She would have brought a knife and tried to stop the growing menace of the Republic she longed for. A different article came out a day later claiming that Padmé’s death wasn’t because of a broken heart but because the Force was being drained out of her. Read that one here. So here’s the extended version of my speculative portrayal of both things but removing the Emperor from the equation, mostly. Anakin had just killed the remnants of the Trade Federation and it seemed like the final dark deed had been done. He has betrayed everything he had ever known or had been taught but it didn’t feel wrong. Then again, it didn’t feel right either. Anakin was still conflicted about his conversion. He had been told about his rage before and how he needed to maintain control as that was the Jedi way but the anger was natural; it felt good and almost soothing. He finally had power and control but maybe at the price of his own soul. What would Padmé think once she knew the truth of what he had done. There was remorse in the back of his mind. But now his love is here, the one person who he could share his secrets with, maybe the only person who could understand and maybe forgive him. Anakin had sacrificed everything to protect her from the ominous dreams and in one embrace he thought that all could be alright once again. But then the blade went through and all the paranoia and betrayal had become all too real. Anakin fully submits to the Dark Side as the suffering that Yoda had mentioned was not the one he caused but rather the emotional and physical wound he had just suffered. Anakin channels the Force in a way he had witnessed but never experienced like this as he uses force lightning through his remaining good hand on Padmé. Obi Wan rushes out to stop him as he stops the vile electricity from taking her life. Padmé was alive but not for long as C-3P0 and R2D2 drag her away to moderate safety. Anakin was now Darth Vader as the only tethers to the side of light had been severed. Wounded but not weakened he fights his old friend and master. The battle would be intense as the Sith’s onslaught would be relentless and filled with fury. This wasn’t about being better or showing them that he was right all along, this wasn’t orders, this was rage personified that only wanted to destroy. Obi Was is a Jedi Master who somehow bested a foe with four lightsabers and yet the speed and the strength of the strikes from the man he once called Padawan and brother have him shaken with fear as he can barely defend himself. Kenobi is scared and he thinks to himself that he could perhaps dip into his own anger and desire for vengeance but as he tightens the grip on his own blade he feels the voice of Qui Gon telling him that if he strays into the dark then all would surely be lost. His resolve would keep him thinking straight and alive as the hope this wasn’t just stalling prevails. The battle intensifies but looks more like Obi Wan retreating from Vader’s rampage. In the process, the blood stain on Vader’s shirt grows more crimson as his breathing becomes more labored. He clutches at his side every so often but realizes that Obi Wan could best him if the fight draws on longer still. Vader unleashes an incredible blast of Force Lightning at Obi Wan in the hope of taking him out right then and there. In the struggle of lightning being blocked by light the Jedi would still be shocked. Kenobi holds on through the pain and redirects the shock back at Vader once he sees a wince and realizes that the wound had taken its toll on the man he called brother. Vader’s body was almost destroyed, Kenobi leaves him shattered and takes the lightsaber from his students robotic grip as he berates that Anakin is dead and has shamed all those he believed in him. The hand that was not robotic was now almost as dark as the glove on his cyber prosthesis. He doubled down on the dark side of the Force and now it had left his body almost withered and worthless. Vader’s connection to the Force left him alive but barely. We return to Padmé, the medical droids try to help her. Rather than wondering why she is dying when she is physically fine, the scenario is far more grim. For all intents and purposes the former queen of Naboo, paragon of the Senate, and almost mother of the Rebellion is already dead as her organs have pretty much stopped working, her injuries too vast. But yet she could breathe and speak as she delivered and named her twins. Having no connection to the Force herself, it was her children that mystically kept her alive. But as they cut the umbilical cords and with that they severed the last thing keeping her in this world. There was hope in these newborns that might just make things right again. We come back to Vader, his injuries mirroring the ones that he inflicted on wife. The Emperor would come and and take him away before encasing him in his cyborg body. But the wound from Padmé tore through a lung, he now needed the machines to help him breathe. And with each long systematic breath he remembers the last time he let someone too close. The new year is pretty synonymous with second chances so why not give one to all my local friendly nerd academics? 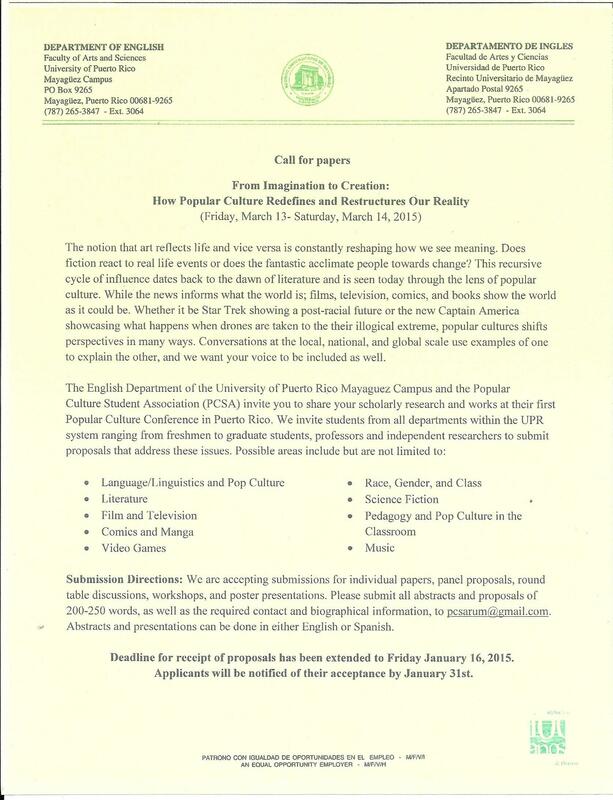 So with the powers invested in me as conference chair for the first ever academic conference on popular culture in Puerto Rico I hereby declare that the CFP has been extended for about two weeks. That’s right, you now have until January 16th to send an abstract our way. If you look at the CFP you will also notice that we amended a few parts to clarify some FAQs. First, you can submit a workshop proposal which are pretty cool and you should definitely consider something worthy of sharing to present. Second, both the abstracts and presentations can be done in English or Spanish. Hell, you can even do it weeaboo l337 if people understand you (please don’t though). So if you have something awesome to present but finals and holidays had your mind in a fog then you have a chance to send an abstract and not hoard your nerdy knowledge to yourself. But don’t wait until the last minute again. Just go right now and type in pcsarum@gmail.com to get a draft started and get the ball rolling. 200-250 words on something you already know and love, easy peasy.